Tracking links is incredibly valuable, because it gives you real data on how your recipients are interacting with your emails. You can learn exactly which recipients are clicking which link, and how many times they click each link. To track a click, the recipient is momentarily taken to a special URL that registers their click, and then is immediately redirected to the intended destination. There are cases when tracking clicks decrease your delivery rates —if you don't use Mixmax's superpowers. Naked links: for example, nytimes.com. Used in a sentence: For details, visit nytimes.com. Regular links, for example, nytimes. Used in a sentence: Look at this funny cat video from nytimes. Naked links give the impression that you're going directly to the New York Times homepage. Spammers sometimes use naked links to trick people into thinking they're going to a specific webpage. For example, the link says bank.com/your-account, but when you click it you're taken to evilhackers.com. For this reason, some spam filters penalize emails that are tracking clicks on naked links. We at Mixmax are looking out for you. We have a setting to automatically turn off clicks on naked links. Find it on the Settings page, in the Tracking section. 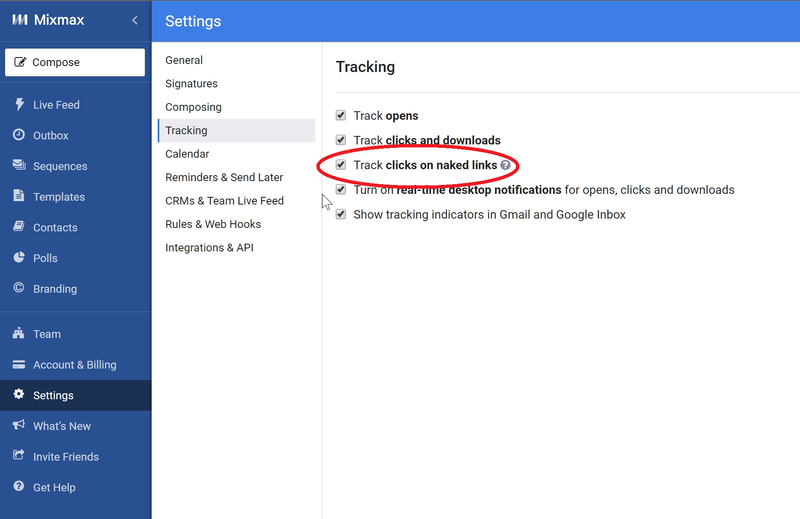 Just un-check the box next to Track clicks on naked links. It's smart to track clicks, because it gives you great insight into how people are interacting with your content. But it's even smarter to track clicks with Mixmax — because we help you track clicks AND stay out of spam filters.